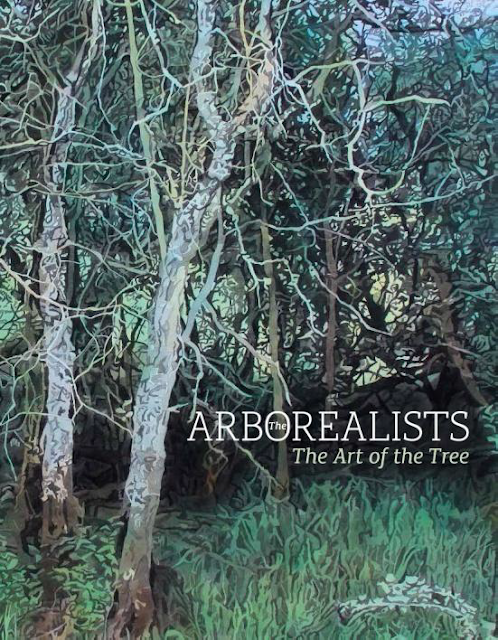 Celebrating Bristol's year as European Green Capital, the RWA launches its winter programme on a fittingly 'green' theme, with Arboretum, exploring the rich history of the tree in art. Here, beneath the shade and shelter of towering trunks, amidst gnarled roots and leafy canopies, the real and the imagined sit side-by-side transforming the RWA's main galleries into a wooded hinterland. Drawing on the romantic tradition in art, alongside ecological issues - such as Julian Perry's investigation into experimental forestry work in Three Pollards - Arboretum intertwines art and environment, capturing a very British symbol of life and renewal. Our 'trees, like ruins, embody history'; which proves to be a consistent thread that runs throughout each artist's work. Dan Hays composes paintings that reflect the low-resolution appearance of early digital photography building up an image with a series of individual pixels. In a similar vein, Hannah Maybank's epic textured surfaces are constructed of delicate layers of paint over latex, built up in stratum like the coiled concentric circles that lie beneath the brittle bark of a tree. These seductive layers of peeling paint are suggestive of a vast history entombed beneath. Jo Barry, Tim Craven and Celia de Serra's detailed pen and ink drawings depict the minutia of trees, from the monstrosity of fallen trunks to skeletal branches, whereas Royal Academician Anthony Whishaw aims to capture what he refers to as a general 'treeness'. Featuring fifty shades of green, Fiona McIntyre, Michelle Dovey and Abi Kremer capture the fabric of the forest in surreal technicolour, foiled by the muted tapestry of Fiona Hingston's tree-scapes dragged from the earth in soil and charcoal. Memory and observation are called upon to create places both real, remembered and imagined. Kurt Jackson's scored and scratched depictions of woodland combine the scrubby, wind-blasted copse of Skewjack in West Cornwall with the rich forest interior of Ashcombe near Bath, informed by memories of Jackson's boyhood spent exploring the squirrel and jay filled oak woodlands of Hertfordshire. In contrast Jemma Appleby's disquieting forest landscape punctuated by the surprising presence of cantilevered rooftops, inspired by the Unison houses of Frank Lloyd Wright, relies on a sense of illusion to create an imagined place. Here, caught somewhere between the tree-top canopy and forest floor hangs a very British blend of fact and folklore, myth and magic, culture and conservation; our past and our future. 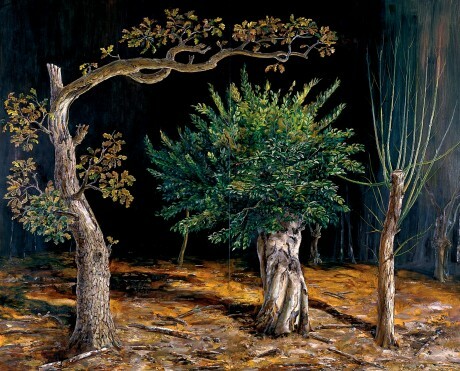 Arboretum follows on from the critically acclaimed and highly popular Under the Greenwood - Picturing the British Tree at St Barbe Museum and Art Gallery. Reprising themes from the contemporary element of this show it explores the importance of the tree as a rich and vital subject for art, featuring work from members of the Arborealists: Jemma Appleby, Ann Arnold, Graham Arnold, Mary Anne Aytoun-Ellis, Joanna Barry, Philippa Beale, John Blandy, Hannah Brown, Gary Colclough, Tim Craven, Celia de Serra, Michelle Dovey, Dan Hays, Abi Kremer , Ffiona Lewis, Fiona MacIntyre, Hannah Maybank, Alexander Pemberton, Julian Perry, Lesley Slight and RWA Academicians Nicola Bealing RWA, Martin Bentham RWA, Kurt Jackson RWA, Howard Phipps RWA, Michael Porter RWA, Anthony Whishaw RWA and Lisa Wright RWA. Arboretum will be showing at the RWA in conjunction with The British Wildlife Photography Awards 2014: A Celebration of British Wildlife. This launches the start of a programme of environmentally focused exhibitions at the RWA engaging with nature and landscape to celebrate the start of Bristol's year as the Green Capital.